What if someone called you and told you that you could see Elton John for $9? Would your jaw drop? Would you ask “Where’s the catch?” Or would you just say “GET ME A TICKET!” and ask questions later? I did all of the above. 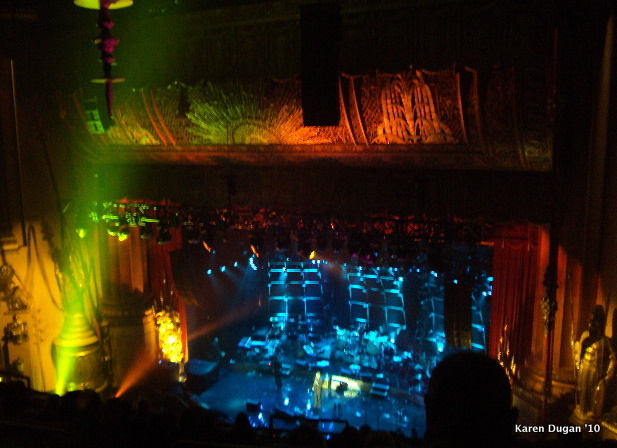 That is what happens when you are told that tickets were on sale to see Elton John and Leon Russell at the Beacon Theater and they were on Stubhub.com for $9. UNREAL!! 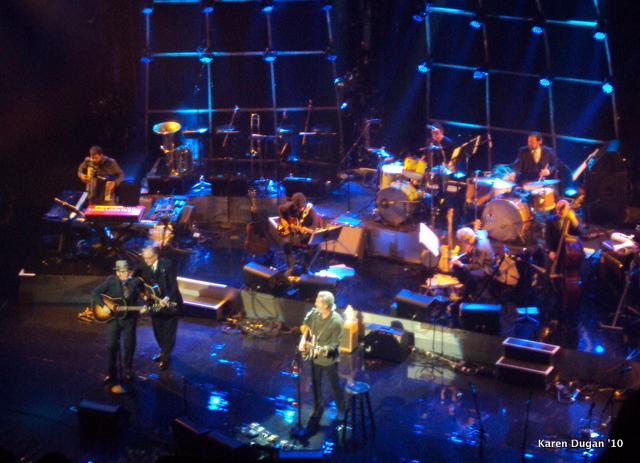 Elton John and Leon Russell, both monster names in the music industry, have come together on a collaborative CD called The Union which just came out on October 19, 2010. So, as if it couldn’t get more unreal, I spend most of the day of the performance sitting at my work desk thinking I was going to see ONLY these two perform songs from their new album and perhaps catch some oldies from each. Time for the second shock!! This time a note telling me that the duet performance of these two had been held the day before. My heart sinks for a minute as I thought we had purchased bunk tickets. But no…it’s better then we could have dreamed. Tonight I would be privileged enough to be see the T-Bone Burnett presents The Waiting For “Supeman” Edition of The Speaking Clock Revue. Joining T-Bone Burnett on stage tonight would be Elton John, Leon Russell, John Mellencamp, Jeff Bridges, Karen Elson, and My Morning Jacket’s Jim James. 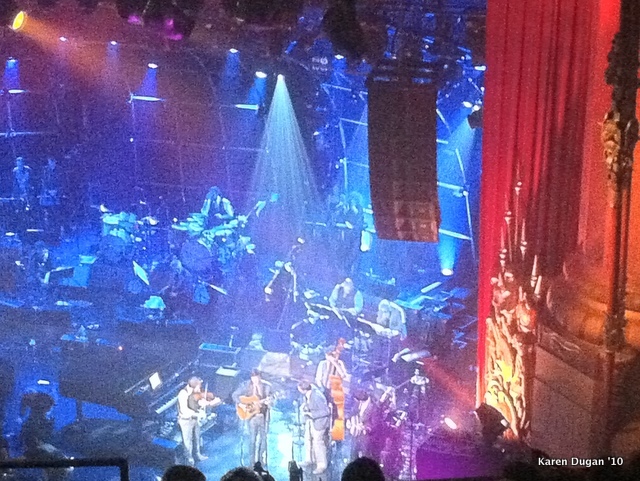 We also had Elvis Costello, Gregg Allman, Ralph Stanely, The Secret Sisters, The Punch Brothers and more. I could feel an epic night of music coming. The Revue title had me a little confused for a moment but it was all made clear over the course of the performance. Davis Guggenheim’s documentary Waiting for “Superman” is a film that follows several students though the American public educational system and analyzes the failures within the system. T-Bone Burnett was so moved by his viewing of the movie and its message touched him so deeply that he put together this REVUE in order to raise awareness to the issues and to the film. The proceeds of the night went to The Participant Foundation in support of including music and arts education in public school systems. T-Bone Burnett is a musical master. A giant in many industries, T-Bone Burnett is a musician and songwriter but most famous as a record and soundtrack producer. 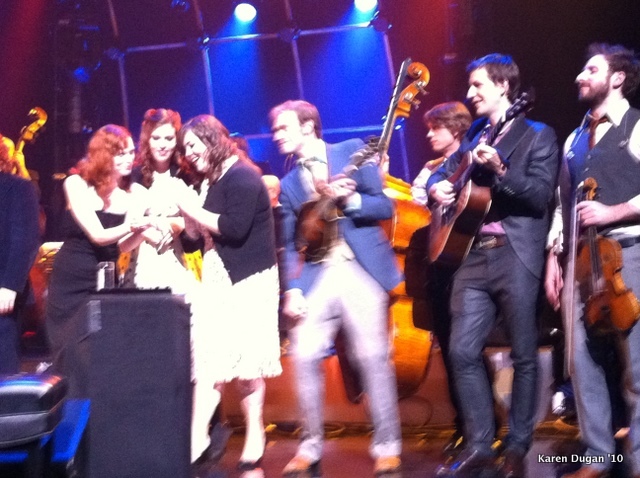 The performers on stage tonight have all been touched by him musically in some way or another. 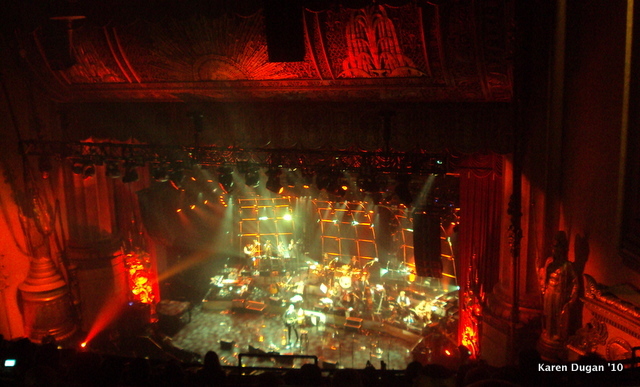 Burnett has produced artists such as BoDeans, Los Lobos, Counting Crows, Tony Bennett, The Wallflowers, k.d. lang, Alison Krauss and Robert Plant. He has won awards for Soundtracks like O Brother, Where Art Thou?, Cold Mountain and Crazy Heart. An amazing musical figure. We walked into The Beacon, walked up to the top level and sat down. 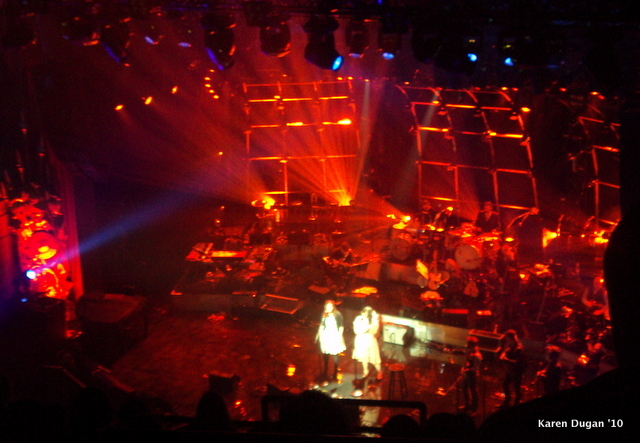 We were many rows away but could see the stage clearly and for $9 there was no complaining. As we walked in, I immediately recognized the voice of John Mellencamp. Coming in at the end of the first song, I believe called “The West End,” he continued on to tell us a story about his dying grandmother. She called him Buddy and one night, she asked him to pray with her. As they prayed she cried: “Lord, Buddy and I are ready to go.”John said, but Grandma, I’m not ready to die. Her response: “Life is short, even in its longest days.” And with that, Mellencamp goes into his popular tune “Longest Days”. The song’s lyrics, that at this moment speaks to me so deeply. Beautiful lyrics and Mellencamp, alone with his guitar and his voice sang it beautifully into our ears. He walked off the stage and it took me only a second to realize that Elvis Costello, in that signature hat, had walked out to replace him and greet the audience. 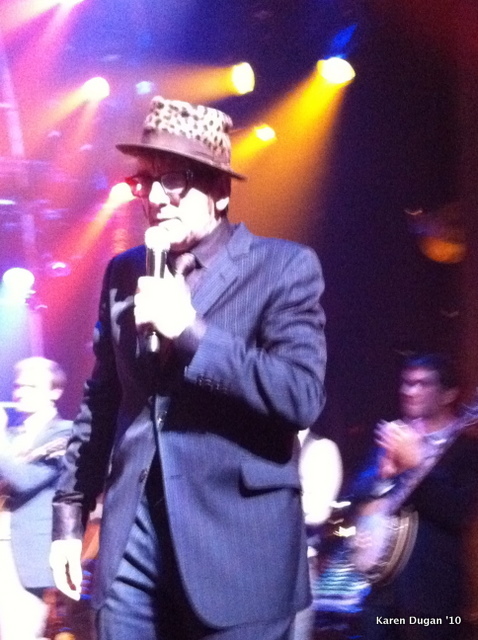 Elvis Costello would be our MC for the night. 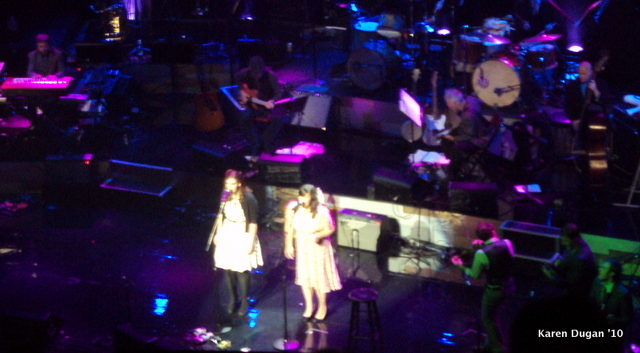 He immediately welcomed to the stage The Secret Sisters. These two raven haired ladies with their bright red lips bust out into the purest version of Johnny Cash’s “Big River” that I had ever heard. Their voices were golden. Angelic. I was awe struck within the first few notes and as I hear my girlfriend to my right take in a gasping breath, I knew the notes were hitting her ears the same way as they were hitting mine. Simply magnificent voices. There is something that must be said about a singing duo of blood relatives. Similar to the Avett Brothers, they have hauntingly beautiful and pure tones, their voices melting together unlike any other group I can recall. Jackson Smith, the son of rockers Patti Smith and Fred (Sonic) Smith, wailed around on his guitar. And then we were delivered a soaring rendition of Bill Monroe’s “The One I Love Is Gone.’’ Their voices digging deeper into my soul, sounding much like the sirens from O Brother, Where Art Thou. Reminiscent of purity that only Alison Kruass has ever been able to reach. This video isnt from the show but I wanna pug them again cause they are beautiful. And with that, out walks Jeff Bridges with his guitar. If I had to pick a weak link in the performance, this would be it. I can barely make out what Jeff Bridges says when he is speaking. Now try to make out what the guy is saying when he is singing. It was pretty hard to do. By the second verse of Fallin’ & Flyin’, a song from the Crazy Heart Soundtrack, Elvis Costello and T-Bone Burnett had joined the song. At least I could understand the words now hahaha. So, speaking like that, he made it sound as if there might be any number of surprise artist floating around backstage. This wasn’t the case and that kinda urked my nerves. However, I suppose that was Elvis‘s way of introducing Jim James of My Morning Jacket because the young guitarist walked out to the dimly lit stage and joined Elvis in Wonderful (The Way I Feel). Jim James was then left alone with his guitar for a solo rendition of Look At You. This set was one of my favorite of the night. It was juts simple, poetic, clean and you could hear a pin drop among the audience. 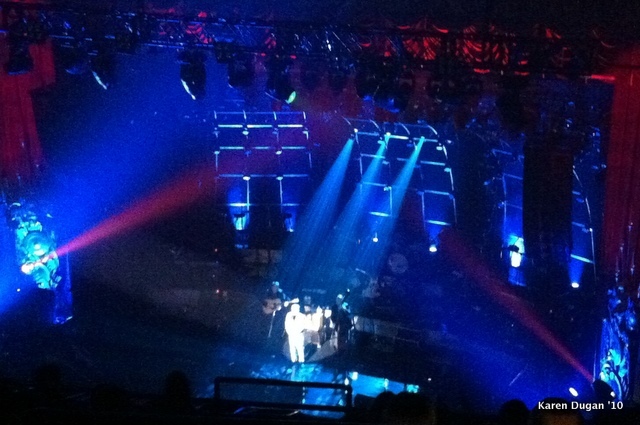 Elvis Costello back on stage again thanking Jim James and calling him “a shy guy from My Morning Jacket. Then he begins introducing some one “who has performed here more times in this theater then all the other artist combined. 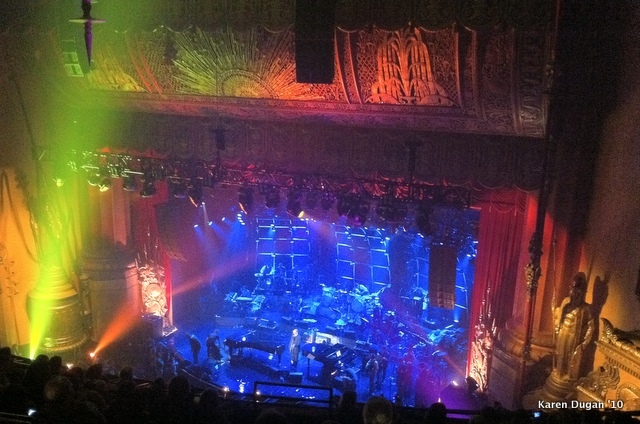 Please welcome Gregg Allman!” The place ERUPTED. Honestly, the majority of the people in the venue were Mule Heads. That was made clear as day after he began walking on stage. The yelling, screaming, howling Gregg Allman‘s name…super fans were in the house. 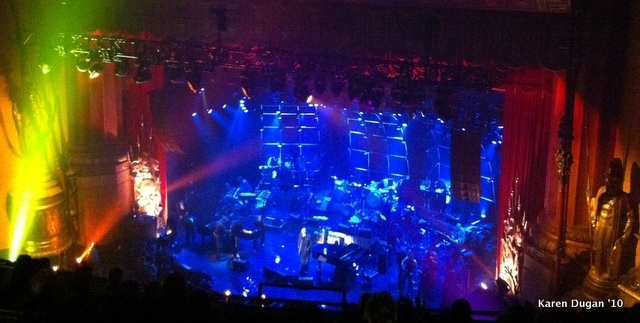 With a 12 musicians backing him, Gregg Allman sang a lovely version of Eric Clapton‘s Floating Bridge. There was a lovely fiddle solo and the washboard stood out. The following song was Savoy Brown‘s Train to Nowhere where the horns I had been seeing in the background finally came alive. Tight but not overpowering. Nothing like a funk horn section but still noticeable and adding a musical level to the country vibe that I enjoyed. Gregg, one of the few artists allowed more then two songs per set, continued on into Blind Boy Fuller‘s Pistol Slapper Blues before he stopped to change his guitar. He says, “I’m gonna do an old song for you” as he went into a beautiful solo guitar rendition of Midnight Rider. He OWNED that song, Man-o-man!! Another highlight of my night. He sang that song exactly as one might want to hear it sung. Not because of the music, but because of his voice. Gregg ended to a loud applause and states: “We will be back in March” as he exits the stage. After intermission, T-Bone Burnett himself comes out to the stage to fill the role of MC as he announces Marc Ribot out to perform Don’t Blame Me. A simply beautiful, wordless tune played through a guitar that sang so lovely. Unsure of who wrote it! Anyone? 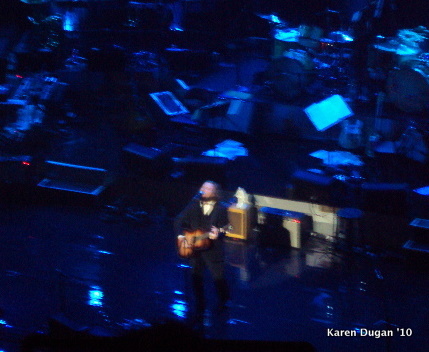 As quickly as he exited, T-Bone Burnett was back on stage to announce Elvis Costello‘s set. Elvis proclaims, “This is what we imagine Rock ‘n’ Roll would sound like in the 1920’s” as he goes into A Slow Drag with Josephine with the help of The Secret Sisters and Karen Elson. Lovely! Elvis Costello‘s upcoming album, “National Ransom,” was the source of many of the songs he chose to sing during his set, I just didn’t recognize them as the music hasn’t been released yet haha. As The Secret Sisters exit, Costello continues on thanking us for supporting the cause as musical education is so important. Unsure of the next song’s title, it was from a yet to be released album filled with trumpets and strings. Elvis was on his mandolin and the song had a acoustic jazzy country swagger to it reminding me slightly of Caravan of Thieves. 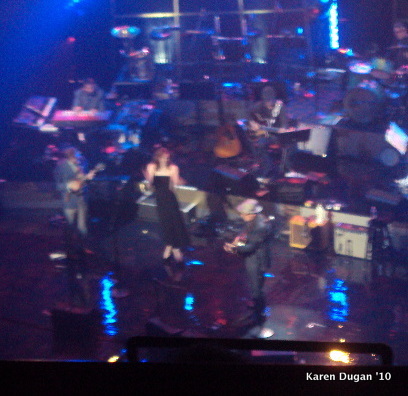 And finally, Karen Elson, wife of Jack White of the White Stripes, was invited back out to vocally support Elvis during Walking Man Blues. 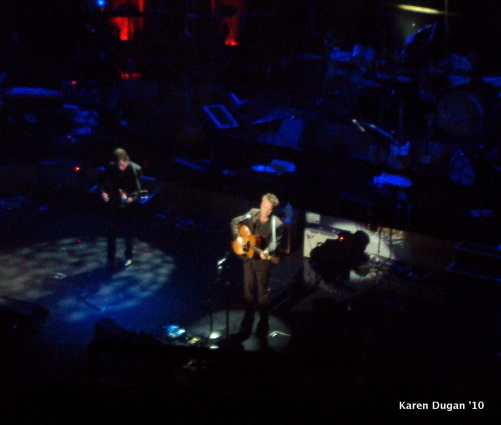 With monstrous applause, Mellencamp ended his set as the lights darkened around him. Elvis Costello was revealed as the lights went up to announce an epically famous name within the country music community. “I made sure to teach m children to love and respect this man,” proclaimed Costello. Ralph Stanely, the last of his kind and wearing a raging sparkly jacket, walked to the center of the stage and approached the microphone. Backed simply by James Shelton on guitar and an unknown on stand up bass (possibly a Punch Brothers?? ), claps and yells abounded as Mr. Stanely went into a folk song for which I sadly missed the name. For his second song, the strings stopped playing and Ralph Stanely projected the gospel song “Lift Him Up” so beautifully. Stars lit up behind him as the stage changed it’s set up for his set. I am not a country fan but it is impossible to deny any major musical influence on the music we listen to. Jerry Garcia, himself, was such a bluegrass head, a jug band kind of mind. Being that there are so many veins of country music, I can’t help but embrace it all, even while I cringe through a few songs. The twang of Stanely‘s voice didn’t hurt my ears tonight. It was lovely. Stanely starts discussing how he has been singing the next song for 64 years. He still isn’t sure who ever really got credited with writing it. And so went into “Man of Constant Sorrow” while James Shelton raged a lovely guitar solo. Wow, that voice, so country, so grounding. T-Bone Burnett discusses Waiting for "Superman"
T-Bone Burnett comes out on the stage again and describes Waiting for “Superman.” Go back to the top to learn about it all if you have skipped to the good music stuff 😉 However, I am sure you are more interested into The Punch Brothers. I know I was! The Punch Brothers were brought out and just slammed into your face with their raging bluegrass strings acoustic goodness…UGH!!! It was so fast, like country rapping with yodeling mixed into the music. 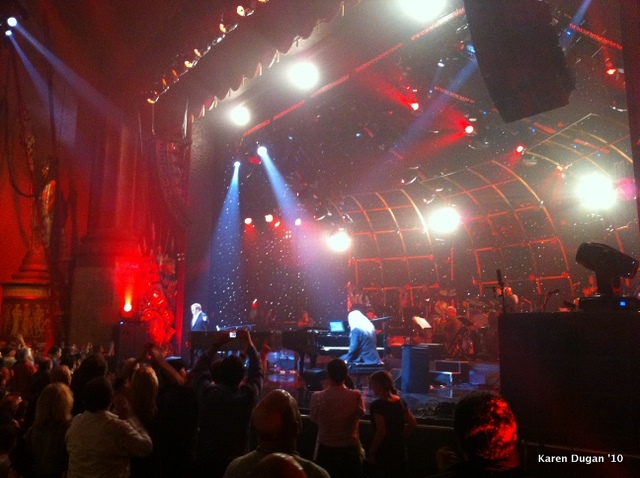 At one point, As all this is going down, stage hands began to set in place two pianos, one slightly bigger then the other. My heart was pounding so fast. 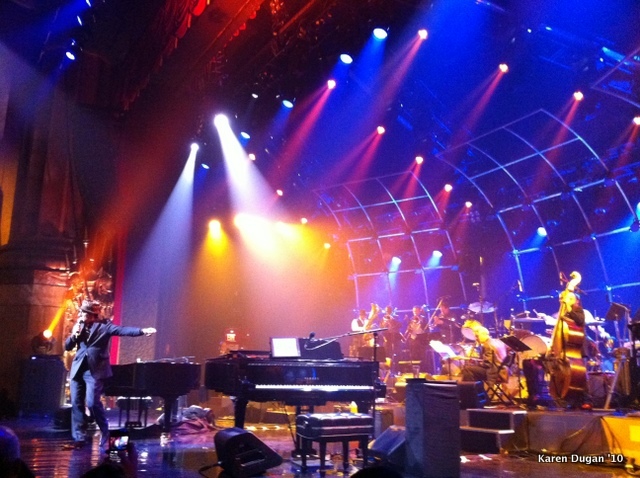 Just seeing a piano enter a stage, I sometimes get shivers, my breath gets faster…like a complete upper has entered my body. I am COMPLETELY addicted to pianos. It’s a deep rooted addiction stemming from my father playing piano every night after dinner in my house. So special. We were in for a treat. The time had finally come. The two men I had been waiting for all night. The two men who’s show I thought I would be seeing earlier that night in first place. 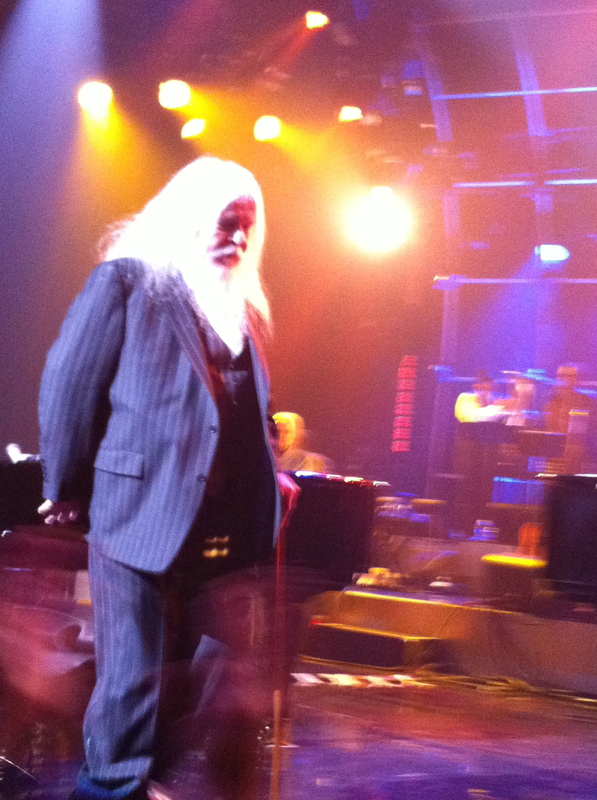 Out walks Leon Russell, his silver mane glowing in the lights. What a master. What a treat I was being delivered AND FOR $9 BUCKS!!! 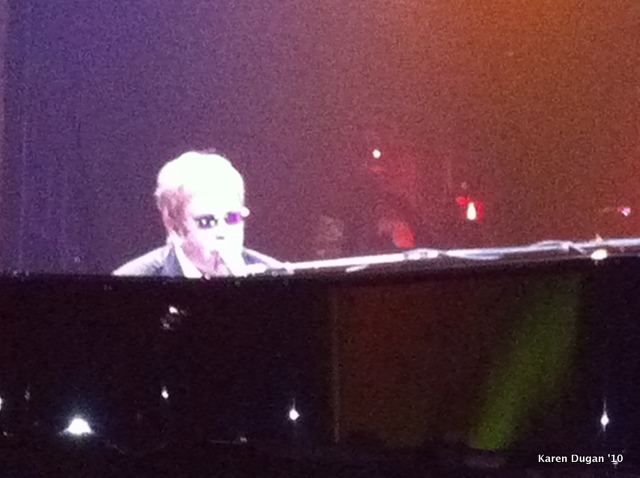 Elton John followed close behind, both sitting at their respective pianos. 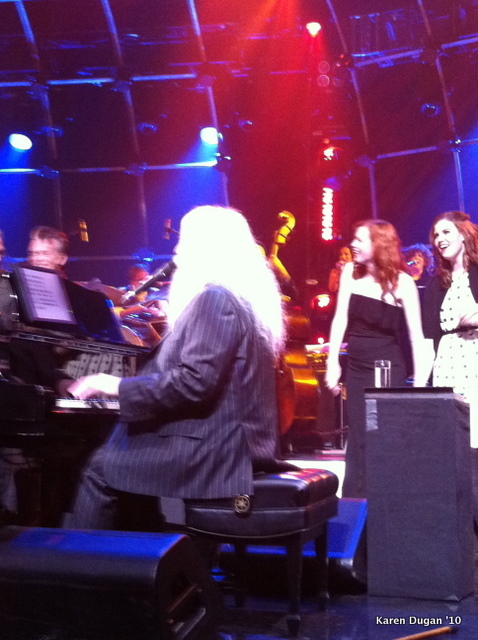 Tonight, Elton John and Leon Russell would be performing songs off their new cd, The Union. Their first pick was the first song off the cd, “If It Wasn’t For Bad,” written by Leon Russell ad sang by both tonight. 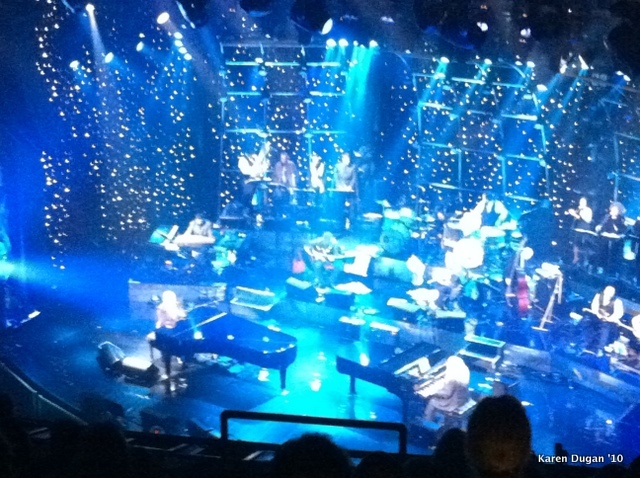 The pianos came alive so deeply, they were immediately above par for many piano players I had ever seen live. 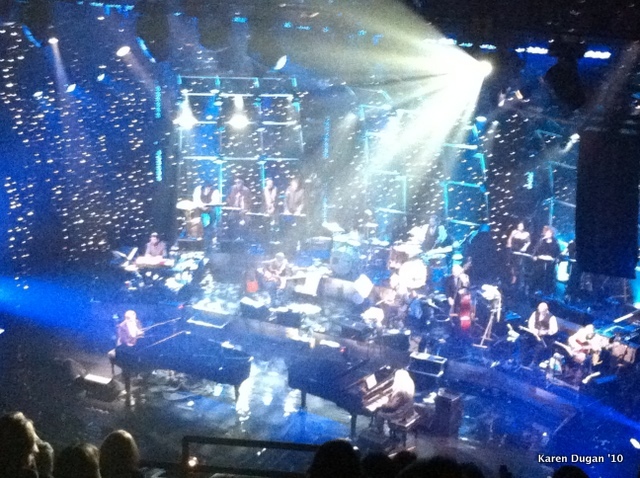 Behind the duel pianos was a full house band, a horn section and four soulful backup singers who were so full of life. I was drawn to one singer in particular who’s name I THINK is Lisa Stone. Sadly, I couldn’t catch their names when, at the end of the night, Elvis Costello threw everyone’s names out at warp speed. The drums were deep and powerful and the horn section ripped it. This was the set we had all waited for and they were delivering right out he hatch. The second song, I believe, was called “Gone to Shiloh.” Russ Paul’s pedal steel guitar solo was superb and there were no horns for this song. The twelfth song off their studio album, “Hearts Have Turned to Stone,” was next. It was a beautiful dueling piano tune and the backup singers were classic. 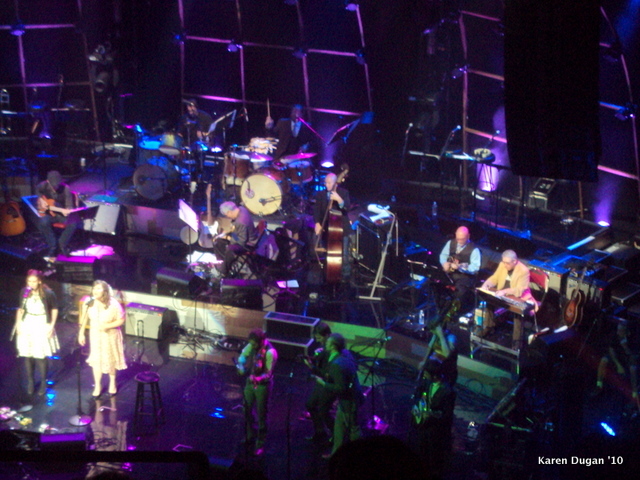 “Monkey Suit,” was next with Elton John on vocals, Leon Russell on lead piano. “Hey Ahab” was the last song picked from album and delivered to the audience. Awesome! The energy in this show was nothing compared to many shows that I attend, but the magic of it all wasn’t lost on me. This was too cool. 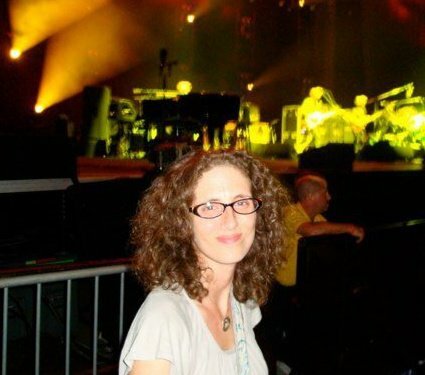 I may never get to see Elton John again being that he could sell out MSG in a matter of minutes for $100 tickets. 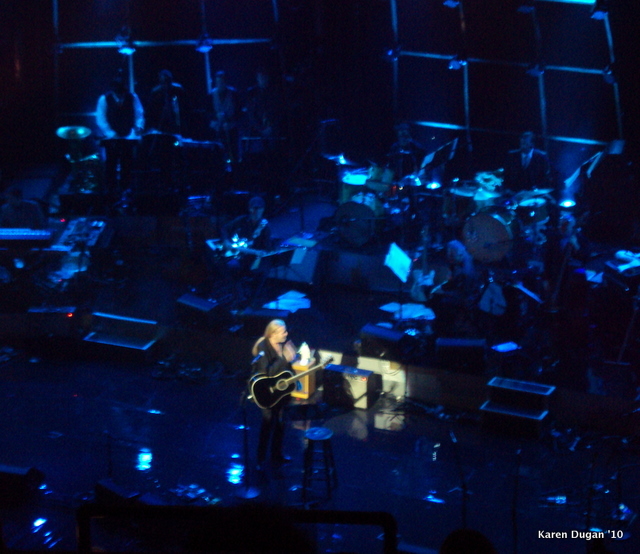 Here we were, seeing him in a barely filled theater with numerous other artists for such a minimal price. it was blowing my mind. Elvis Costello Giving it up to the piano men! There was no encore really. 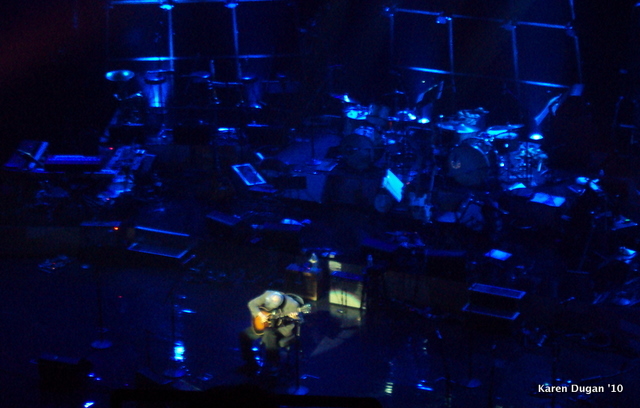 Instead, as all the musicians on stage that night gathered one by one, they sang “There’s No Tomorrow.” T-Bone Burnett, lacking in view most of the night but his presence being ever present in each song’s note, joined the stage to a furry of handshakes and a standing ovation.